The other day Sam asked me about milkmen. In the Louis Sachar book he was reading (The Cardturner), the main character had never heard of a milkman. And I suppose that wouldn’t be uncommon these days. For most of us, the era when low value items (rather than whole take-away meals) come round the streets to your door, has long gone. Actually, even here there are no milkmen. (Milk seems to come only in powdered form – or in sealed plastic bags only available with a ration card for people with babies.) 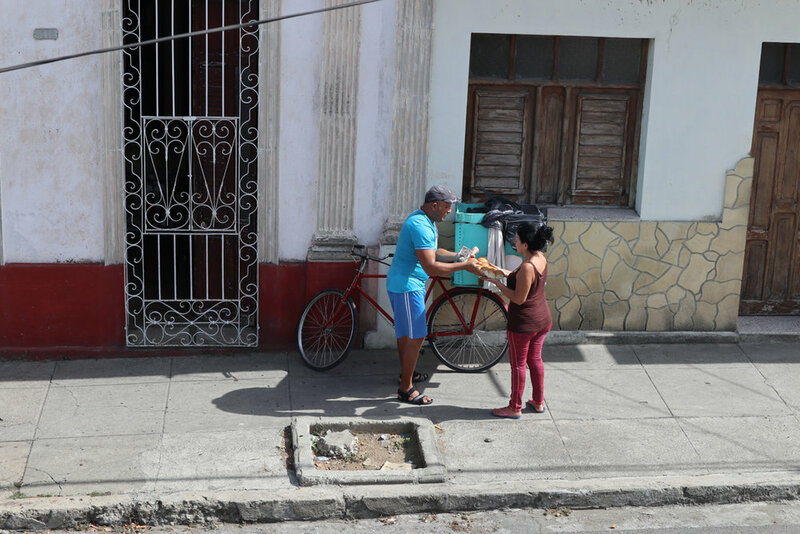 But each afternoon the bread seller comes round on his bicycle, with fresh rolls in a tray over the front wheel. He blows a whistle to let you know he’s coming. Often there’s a second seller who arrives with flat loaves, who yells “pan” as he approaches. Then there’s the vege man – tomatoes, peppers, cucumbers and yukka are the main staples at the moment. And there’s a guy who wanders the streets with garlic and shallots carried in long strings around his neck. Down towards the square there are carts with fruit – mangoes are everywhere (3 for the equivalent of about 50 US cents), plus guava, bananas and pineapple. We saw our first avocados yesterday, so hopefully they are coming into season. And the other day we bought some fish from a guy we passed on the street carrying a paint pail-full of unknown fillets. It was delicious. I haven’t been brave enough yet to buy meat from one of the sellers who will cut you off a lump from a carcass on an unrefrigerated slab in a crumbling, open-fronted shop. It is still a leap too far for me from supermarket pre-packaged.